3DOKid wrote: Great list by the way! I have some questions. - The Daedalus Encounter was released in PAL? I have Double Jewel Case version. I have Twisted too. - Doom was never made PAL? What do you think? Some dodgy shop keeper slapping on his own sticker? My Sewer Shark has the same stickers and I've included it on my list in the section listing US long box games which were had stickers added so they could be sold in the UK. Daedalus encounter is in a double case so appears PAL but it was sold with an ELSPA sticker on it (which makes it appear like a US game re-branded as per Sewer Shark). There is a lot of discussion regarding this earlier in the thread but I think either it is PAL and the ELSPA rating was omitted in oversight (and later stuck on) or it was a US double case game (owing to the number of discs) originally in a long box (it does fit apparently). No, as with Sewer Shark and many more, Doom came in a long box with an ELSPA sticker on - it had no dedicated PAL packaging. Ah so it's definitely a US game. That double case causes a lot of confusion. Thanks for clearing that up. FZ-SK code. Interestingly it's FZ-SK001, probably the first and last of it's kind. Wonder what it's a reference to? Could it possibly be a Korean release? I got around to checking out my Panasonic 3DO games. They're all SM except Icebreaker... which is SW. Like Neo's, it's 0001. Martin III wrote: I got around to checking out my Panasonic 3DO games. They're all SM except Icebreaker... which is SW. Like Neo's, it's 0001. I got dragons lair off eBay last summer after searching everyday for about a year. Ironically 2 copies appeared at the same time, I haven't seen another copy listed since. Do you have Johnny Bazookatone? I got my copy in 2012 from Italy and I've never seen another copy since. I have another world in both pal and ntsc, other than the ntsc being named "out of this world", the cover is completely different aswel. Has anyone got a picture of Waialae Country Club (UK Version), all I can seem to find is the German double CD case version (FZ-SE0102) and the US single case version (FZ-SM0102). Oh by the way I almost forgot, there's actually 82 games not 81. 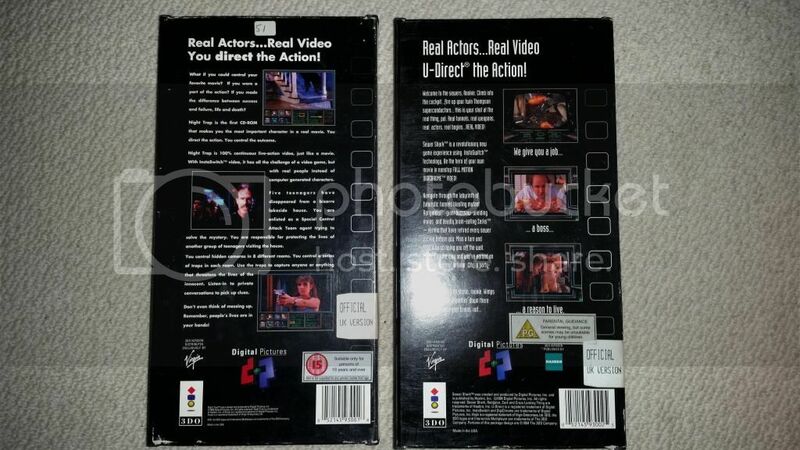 I have a game in a double CD case, with ELSPA age rating & "This title displays in letterbox format on the 3DO PAL system" printed on the back cover, and it isn't on any lists I can find anywhere only the US & Japan releases. Tinsair wrote: Oh by the way I almost forgot, there's actually 82 games not 81. I have a game in a double CD case, with ELSPA age rating & "This title displays in letterbox format on the 3DO PAL system" printed on the back cover, and it isn't on any lists I can find anywhere only the US & Japan releases. What game would that be? Have you got a picture of Waialae Country Club (UK Version) single cased release, as I've never seen this, does it exist? I'll get a picture of the game I have, that's not listed shortly. Tinsair wrote: Have you got a picture of Waialae Country Club (UK Version) single cased release, as I've never seen this, does it exist? The game is Cyberia, double CD case and a manual thats too fat for the case. Tinsair wrote: The game is Cyberia, double CD case and a manual thats too fat for the case. I've seen it listed on a couple of game collection sites, so that must be where you see the scans too. I only recently got this, but I hadn't seen it before, and so far since. It's weird that the manual is super fat, but it's not the thickness that makes it not fit inside the case but it seems slightly too long so when you close the case the manual blocks it from closing. Yeah I'd seen it on rf generation or something. I'd never seen one for sale, there's a completed listing on eBay just now from one that sold in Germany recently. If there are anymore games released I'd imagine they'd be extremely rare, like the 'big 3' on the Sega 32X type numbers! That completed listing was me that bought it, seeing as I couldn't find much info anywhere I thought what the heck and got it. When it arrived the manual was inside the case but as soon as I unpacked the bubble wrap the case sprung open, so I get the feeling it may have been shrinkwrapped to the case at some point. But whatever way it was packaged that is most probably the reason why it's so rare, either they scraped it because of how the manual didn't fit or as you say maybe a mail order of some sort. Well, I'm needing 3 more standard PAL games (not ones with ELSPA stickers on longboxes) to complete a full PAL set. They're all proving very elusive at the moment.